On the occasion that Sarah and I go out to dinner, whether it’s with friends, or just as a family, there comes a time or two or three where one of us will need to take Maddie or Sophia to the bathroom for a diaper change. BUT, all-too-many times, after we’ve gone to the bathrooms on our own, we have discovered that there are only changing tables in the women’s restroom. None in the men’s restroom. This makes it difficult for me to change a diaper. And it doesn’t seem to make sense. Afterall, there are plenty of dads out there that takes their kids out to eat, ya know, without a mom present.I don’t know if this is a conscious or unconscious decision by the restaurant owners or not, but it seriously makes no sense. A fellow dad blogger, Dads Who Change Diapers has made it his mission for the last four years to create a map with locations of dad-friendly restaurants with accessible changing stations for all you dads out there. In fact, he’s asking for the public’s help in populating that map. Go check out his post and help him get the map filled out! I know that whenever we go out and Sarah is forced to change Maddie or Sophia every single time during dinner, it’s frustrating for her. We should be able to take turns, and I shouldn’t need to worry about there not being a changing table on the occasion that I’m out with the girls in public on my own. The last time we were out to dinner, which just so happens to be written about in my last post, Sarah needed to take two different trips with the girls just to get them changed, while I felt pretty useless just sitting at the table without them. Hey, restaurant and other public place owners, get your stuff together, will you?! 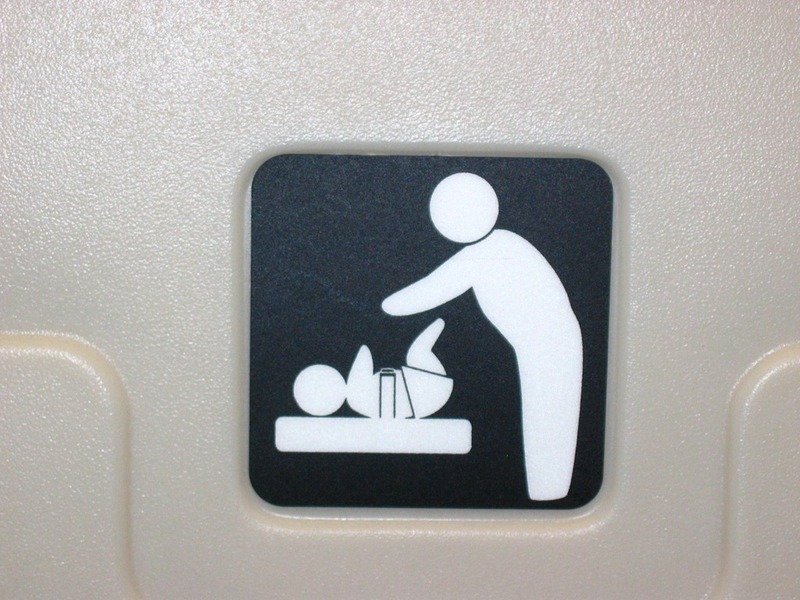 If you don’t want to put a changing station in the men’s room, then maybe you should consider adding a family restroom. Yes, that would take up more room in your space, but it would make it far more family-friendly, and something that could be a benefit to you and your patrons. It just seems like such an odd thing to leave out, since, ya know, dads have been around, oh I don’t know, only as long as children have been around! Come on! Next time you are out and you notice a restaurant or other space that does or doesn’t have a changing station accessible to dads, make a note. Heck, maybe ask to talk an owner or manager and let them know. Or, find the business’ website and contact them. And of course, go and help Dads Who Change Diapers! Follow me on twitter!Like me on Facebook!